Keeping in mind the ever-evolving needs of our clients, we are devoted towards offering an optimum quality array of L&T Star Delta Motor Starter. Star Delta Starting is one of the methods of starting of 3-Phase pump-sets. In Fully Automatic version of Star-Delta (FASD) Starter, the changeover from star winding to delta winding is done with the help of a timer. L&T offers two variants of FASD – called starters and controllers. FASD starters are basic electrical starters with contactor and relay combination for ON-OFF operation and overload protection of the pump-sets. Over and above the ON/OFF operation and overload protection features equipped in Controllers, it also provides additional features like Auto ON, indications of Supply ON/OFF and Pump ON/OFF, reading of real time voltage & current of pump with unique Dual analog meter. 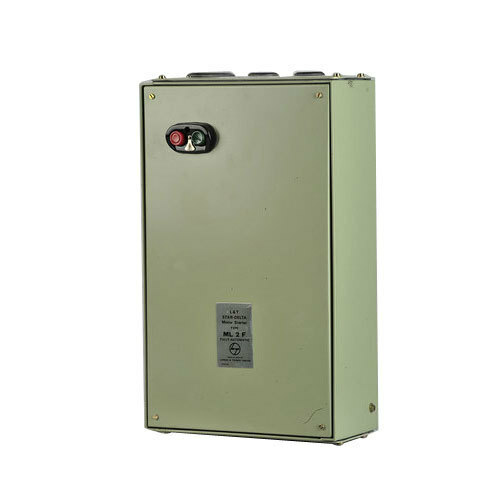 Single phasing protection relay (SPPR) inside Controller unit provides the advanced protection features viz. single-phasing prevention, phase-reversal protection, phase-unbalance protection, variable time-delay adjustment for delayed operation of pump set. Established in the year 1995 at Ahmedabad (Gujarat, India), we “Kumar Electric & Engg Co” are a renowned Authorized Wholesale Dealer of an excellent quality range of Electric Motor, Electric MCB, Correction Capacitor, Energy Meter, etc. We are a Sole Proprietorship firm and we source products from the reliable market vendors which can be availed from us at reasonable prices. Under the guidance of “Mr. Amarpal Shah” (Owner), who holds profound knowledge and experience in this domain, we have been able to aptly satisfy our clients.